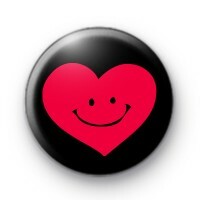 This is a black 1 inch pin badge with a super cute bright pin heart which as a happy smiley face in the middle. It is a fun positive pin badge, you could gift this to someone and help share the love. Or pin it to your bag to spread the positive vibes. All our pin badges are handmade in the UK by us with love. Fantastic Custom Badges in superfast time!